Today the press in Japan had the chance to attend a large press conference to speak about the December 30th show in Tokyo. 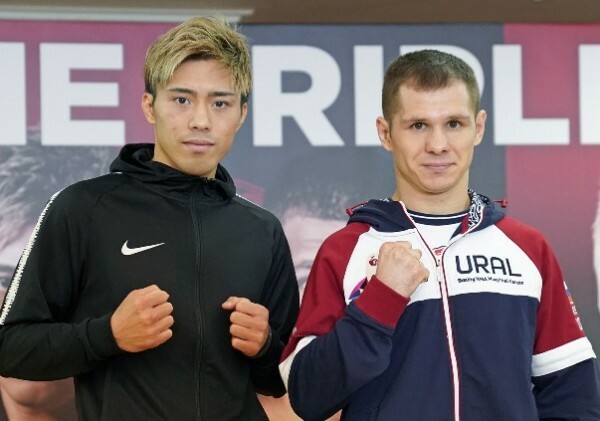 Among the fighters there were WBO World Jr. Lightweight champion Masayuki Ito (24-1-1, 12) [伊藤 雅雪] and his upcoming Russian challenger Evgeny Chuprakov (20-0, 10). At the press conference Ito stated “I wanted to make a good game that would make you think that Ito was the best” (translated from Japanese), and showed enthusiasm about expanding his standing in the sport. Ito also explained that he’s confident having been able to win the title in America and is now proud of being able to defend the title in Japan. Despite the champion he wants to feel like a challenger, and fight like a fighter with the chance of breaking out and would be fighting aggressively, as he did in his title win against Christopher Diaz. In a great gesture Ito also revealed that he will be selling items, including wrist bands and t-shirts, with the money made from the sales going to charity. Chuprakov told the press “I am doing very well, becoming an important match among the long boxing careers I am ready for the mind and body, I’m looking forward to Sunday, It is very worthwhile to win.I came to become a world champion until now, I want to fight all my thoughts and battle quietly to win the belt.” (Again translated). He seemed calm and confident, but this is a but step up for the unbeaten Russian, who hasn’t fought anywhere close to this level before.